Unit conversion is a method of calculation by which user can convert a specific unit into different unit of measurement for the same quantity, typically through multiplicative conversion factors. In our daily lives we come across this problem whether it is with cooking recipes, buying vegetables, physics equations or simple correspondence from a friend from half around the globe – different unit standards make successful communication tricky, and can sometimes lead to hilarious and/or dangerous errors. No more worries! Silver Touch Technologies has developed a multi-platform smartphone application which is available in Google Play Store, iTunes, Windows App Store and BlackBerry App Store. It can help you with converting whatever units you want to convert into units that you understand. From the common feet to meters and gallons to liters, this application will be able to convert fuel consumption, currency, distance, velocity, density, energy force etc. 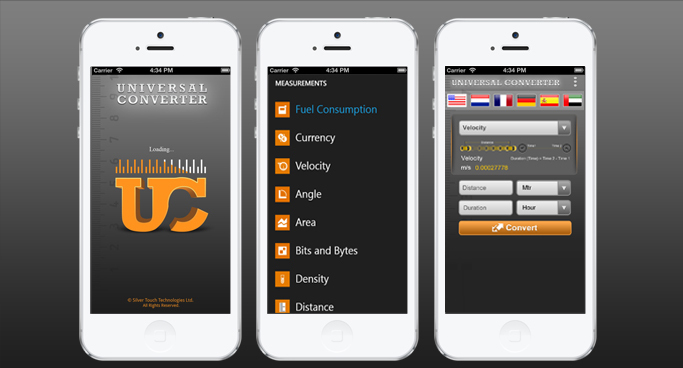 Universal Converter App possesses 20 types of conversions and 3 types of calculators. You can use Universal Converter from anywhere, anytime using your Smartphones even without internet connectivity. You may not have noticed this yet, but there are very few numbers we use in our daily life that do not have a unit. When we say “speed limit is 50″, we implicitly mean “50 kilometers per hour”; in this case the unit is km/h. When we are in a vegetable market! We will buy say “look, eggs! I’ll have a dozen of those”, the unit is dozen: a dozen of eggs. There are exceptions of course but most usages of numbers in our daily routine usually involve a unit. Think of every time that you ask for something. You usually have a quantity in mind, such as 10 gallons of gas or 5 pounds of sugar. Items are sold by weight, length, number of items, and many more units. In science experimentation, observations and data are recorded using measurements. These measurements are often shared with other scientists who are also working on the same type of experiments. In order to share results, ideas, or trade goods, people need to be able to communicate their measurements in terms that everyone understands. It is very easy to convert any unit to all other possible units using Universal Converter Application. Universal Converter is available for iOS, Android, Windows Phone 8 and Blackberry Platforms. It is very easy and quick to operate even for the first time. This makes learning Unit Conversion Tool a snap and will increase your productivity dramatically while flattening the learning curve. You can save lots of time by using the universal converter as it works in offline mode too. And it provides you accurate conversion results in almost all units available for measurements. 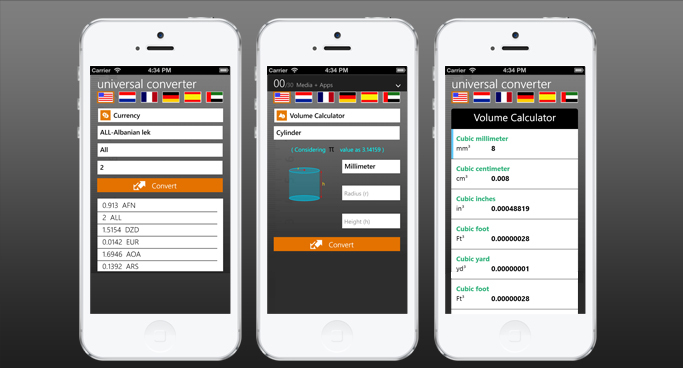 ‘Universal Converter’ is a Metrics to Imperial and vice versa Converter and is available in six languages English, Spanish, German, Dutch, French and Arabic. The application converts Fuel Consumption, Currency, Angle, Area, Bits and Bytes, Density, Distance, Electric Current, Energy, Force, Frequency, Pressure, Speed, Temperature, Time, velocity, Volume, Weight, Cooking Measurements etc. Each measurement unit value can display converted result in all possible units for that measurement. The application also provides facility to calculate Volume, Velocity and Density and displays converted result in all applicable units. You can use this application even if you do not have internet connection and it gives you perfect solution and you will get 99.99% accurate answer. 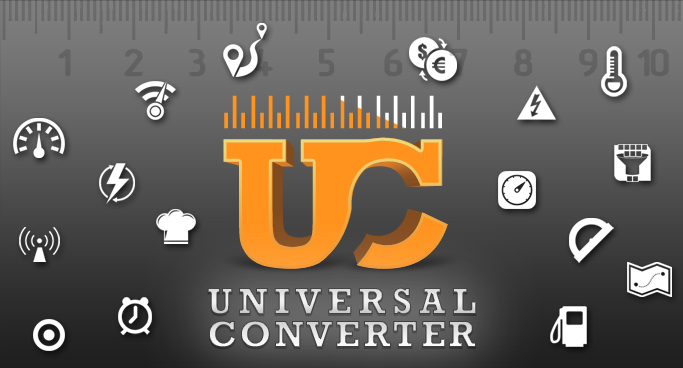 Since Universal Converter application is available free on store for all platforms, just download the application from store, install the app on your smartphone and open the app, select your conversion units and then type in the value and click on ‘Convert’ for results. This application is user friendly interface with providing instant and accurate result. It is highly used and appreciated by teachers, students, and statisticians. This proves to be a perfect solution for field work and you are virtually guaranteed to find the exact conversion unit when needed! Universal Converter gives an accurate and instant output to all inputs. The application is designed and developed to make conversions as simple as possible. This is the fastest way to convert any unit of measurement to another unit. Thousands of scientists, mathematicians, students, business people, travelers, and even homeowners use our fast and accurate conversion application every day. You can download and check Universal Converter application from respective app store iOS, Android, Windows and Blackberry.